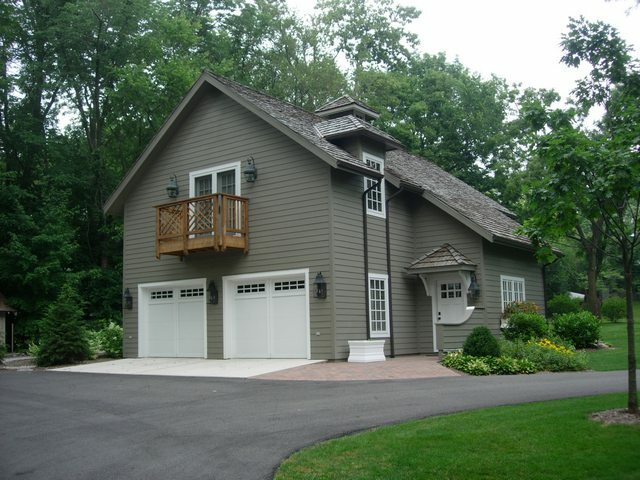 This project was the creation of a Carriage House as an accessory structure for a lake home on Lake Maxinkuckee. This was completed for a past client for which we had just completed a Lake House renovation. There was an existing structure on the site that was in disrepair. The existing structure had been used as a storage shed with an upstairs that the owners had used as a retreat for their children. Now that their children were grown, a guest house was more appropriate. Renovating the existing structure was not an option due to its cramped size and location. It sat on the very edge of the property (within the side yard setback) and under Culver’s Zoning Ordinance, two residences are not allowed on the same lot. Fortunately the property was large enough to allow it to be subdivided. 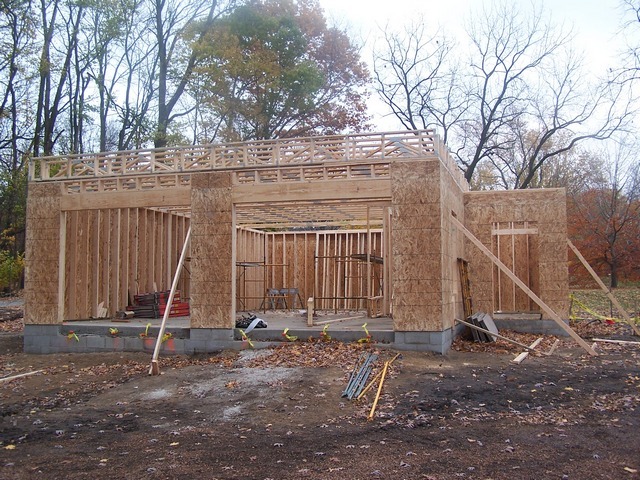 We assisted with subdividing the property, siting the new structure and reconfiguring the driveway for access to both the new carriage house and the existing lake house. In various stages of this process the owner employed designers they were familiar with to arrive at concepts that we fleshed out and brought to fruition. The structure was designed with clearspan garage space on the first floor through the use of floor trusses as seen in the framing picture here. The completed project included a custom winding stair with brass handrails emulating a nautical theme. We continued this theme in a unique bunk bed system suspended from the ceiling by heavy chains. The master bedroom included a balcony with a view of Lake Maxinkuckee. Natural light was provided throughout the kitchen and dining area via large windows and a vaulted ceiling leading up to a central cupola. The overhead doors were chosen to emulate traditional carriage house doors. Custom railings were designed from a concept chosen by the owners. Cement board siding was used on the structure giving it a traditional wood siding look, but with enhanced durability.